89/123 David Mumpower They should have done a Family Circus movie instead. large size creates chaos, hilarity ensues. Inevitably, it’s been turned into a family film, which, you know, fair play and all that, as it’s not exactly something you’d give to the Coens or David Lynch to direct (although I’d like to see their takes all the same). Hollywood still seems to think these kind of films need to be as dumb as possible to be successful, and that’s clearly the approach they’ve taken here. In this live-action take, Marmaduke is voiced (oh yes, the animals talk) by Owen Wilson, who narrates us through his wacky adventures in a dog park after moving to California. Also providing voices are George Lopez as the family cat, Kiefer Sutherland, Emma Stone, Chris Mintz-Plasse, Steve Coogan and Sam Elliott, with the main human roles going to Judy Greer, Lee Pace and Bill Macy, who’s apparently being paid $200k per hit to the crotch. 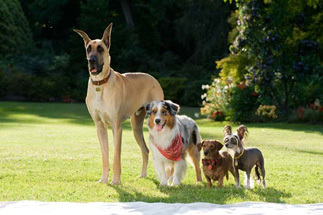 See the latest developments for this project on the Marmaduke Movie News page.